"Buendner Nymphen" typical nymphs from the Swiss alpine Canton Grisons - made as described in the original pattern books - are the most effective nymphs for fine trout and grayling subsurface fishing. Not only in the Grisons mountain creeks- but everywhere where you find difficult fish. Their success is due to their "Chrälleli"- fine and light brass clasps as they were made long ago. 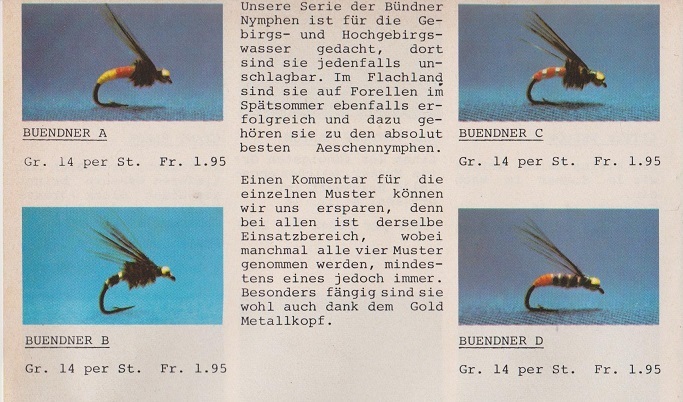 Only Swissflies can offer you these original "Buendner Nymphen".